Oh man, I’m so excited about everything happening on the blog this week! (Have you entered my giveaway yet?). Well, here’s one more thing to add to the list – the very first NoshGirl Chef Challenge! NoshGirl’s 2011 Gift Guide + a GIVEAWAY! ‘Tis the season for holiday cheer and thankfulness! I am SO thankful to all of you who have followed along with Big Apple Nosh this past year! In celebration of the season, I’ve compiled a short list of items I would love to give and receive. The list includes many of the most treasured/delicious/useful food and cooking items that I’ve enjoyed in 2011. At the very end, I’ll be giving away one of these coveted items, so be sure to keep reading! I first saw this bowl set live at the MoMA Design Store here in NYC, and let me tell you – they are as cute and clever in person. Now for practical purposes, I’m usually a proponent of stainless steel bowls for baking (they are sturdier and are easier to rid of grease if you’re making meringues or something equally finicky). However, I must admit these bowls would dress up my kitchen counter way better than a stainless steel bowl would! They are “bowls for show,” one might say. I’d like to give a hearty congrats to the winner of the fourth NoshGirl Chef Challenge! Latte Love‘s Peach Caprese Salad with Champagne Mint Vinaigrette impressed voters with 20 votes for the WIN! Voters loved the creative take on a traditional dish using the two mystery ingredients – peaches and mint. Congratulations, Latte Love! Two authentic NYC black-and-white cookies will be making their way to your doorstep! I would like to thank challengers Home Sweet Hopkins and Married Up With Wine for their really innovative (and beautiful!) submissions of Mint Chocolate Dipped Peach Sandwich Cookies and Chilled Peach & Mint Yogurt Soup, respectively! All three entries cleaned up in the votes – this NoshGirl Chef Challenge is getting tougher and tougher! Happy Thursday! Almost the weeeeekend! I’d like to give a hearty congrats to the winner of the third NoshGirl Chef Challenge! 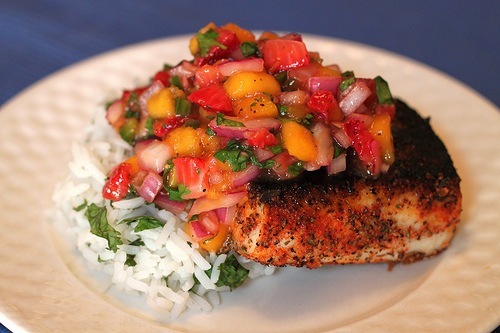 Katie, of Ruffles & Truffles, impressed voters with her recipe for Blackened Mahi with Strawberry Mango Salsa – with 37 votes! Voters loved Katie’s use of the two mystery ingredients – strawberries and black pepper. Congratulations, Katie! Two authentic NYC black-and-white cookies will be making their way to your doorstep! I would like to thank challengers Amy (Life After Lobster) and Anni (A Room With A View) for their delectable submissions of Sweet and Spicy Strawberry Ribs and Strawberry Grape Focaccia + Perfect Lemonade, respectively! All three the entries got a sizable number of votes – man, this NoshGirl Chef Challenge is really heating up! !